You can make detailed homemade models of human body parts using polymer modeling clay. Polymer modeling clay is easy to work with and readily available at most art and craft stores. Models can be made using realistic clay colors or each separate section of the part can have a different color for demonstration purposes. Once you form the model, you can bake it in a conventional oven to permanently harden it. 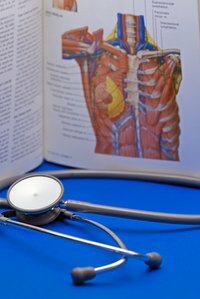 Research the body part for the model using biology and human anatomy textbooks. Look for pictures of the specific part from a variety of angles. Read the information about the part's function to better understand its elements. Form the components of the body part, starting with the interior and working out. Reference the textbooks' diagrams and pictures to include details in the design. Use sculpting tools, such as plastic forks and knives or anything with a hard edge, to give the surface the correct texture. Compile the pieces of the model to make sure they fit together. Make adjustments until you are satisfied with how the pieces fit together. Take the body part model apart carefully. Line a baking pan with a silicone baking insert and place all the individual pieces on the lined pan. Bake the pieces in a oven preheated to 275 degrees Fahrenheit, for 10 minutes. Pull out any pieces of clay less than a ¼-inch thick and leave the others to continue baking. After another 10 minutes, pull out any pieces less than ½-inch thick. Bake the remaining pieces in 10-minute intervals until everything has completely hardened. Reassemble the model on the baking pan once all the parts have completely cooled. You may choose to cover the assembled model in a ¼-inch layer of polymer clay skin. Return the clay-skin covered model to the oven for another 10 minutes at 265 degrees Fahrenheit to harden it and form it to the model. Dried polymer clay can be painted or labeled for demonstration or artistic purposes.